Each year in August I'm faced with the same dilemma; choosing a cake to bake for my husband's birthday. I agonize over the flavor, filling, frosting, and decoration. Clearly a problem that comes from having too many choices. Not knowing what to do, I turned to my bible of Maida Heatter baking books. They are a treasure trove of inspirational desserts. I narrowed the cakes down to chocolate, because hey, chocolate! The name, County Fair Chocolate Layer Cake, suggested it was a winner. The cake was moist, not overly sweet, and had a beautiful crumb. I paired it with a smooth and creamy snow white marshmallow filling and frosting. Heaven. I made 2 versions of this cake; first in 3- six inch layers that I topped it with fresh figs, apricots, and raspberries. The second time I used 8 " pans to create 2 layers. I added fresh sour cherries (very well drained) to the filling and kept the frosting unadorned. Either way, it was delicious! Preheat oven to 350 and adjust a rack to the center of the oven. Butter 2 -8 inch round cake pans or 3-6 inch round cake pans. Dust them with flour and set aside. Sift together the flour, baking soda, salt, and cocoa in a bowl. Set aside. Using the paddle attachment of an electric mixer, cream the butter. Add the vanilla, and then the sugar. Beat well. Beat in the eggs, one at a time, scraping the bowl with a rubber spatula, and beating well after each addition. On low speed add the sifted dry ingredients in three additions alternating with the milk in two additions. Scrape the bowl with the spatula and beat only until smooth. Divide the batter between the prepared pans and spread smoothly. Bake until the layers just begin to come away from the sides of the pan. This can take about 35-40 minutes in the 8" pan or 20-25 minutes in the 6" pans. Cool on a rack in the pans for 5 minutes. Then, using a small knife, carefully cut around the sides to release the cake from the pans. Allow to cool completely on a rack before filling and frosting. NOTE: to measure 2/3 t., measure 1 t. and with a small knife, mark it into thirds. Then cut away one third and return it to the box. Place the sugar, cream of tartar, and water in a 6 cup saucepan (tall and narrow is best). Using a heatproof spatula, stir over moderate heat until the sugar is dissolved and the mixture comes to a boil. Cover and boil for 3 minutes. Uncover and insert a candy thermometer. Raise the heat to high and boil without stirring until the thermometer registers 242F(medium ball stage). Shortly before the sugar syrup is ready, or when the thermometer reaches the soft ball stage, add the salt to the egg whites in the large bowl of an electric mixer. Beat until stiff. When the syrup is ready, turn the mixer to high, and in a slow but steady stream, gradually pour in the syrup. Then beat at high speed for another 5 minutes or until the frosting is quick thick and stiff. Mix in the vanilla. The frosting may be used while it is still warm. Spread the frosting about 1/2" thick in between the layers. Frost the top and sides of the cake. 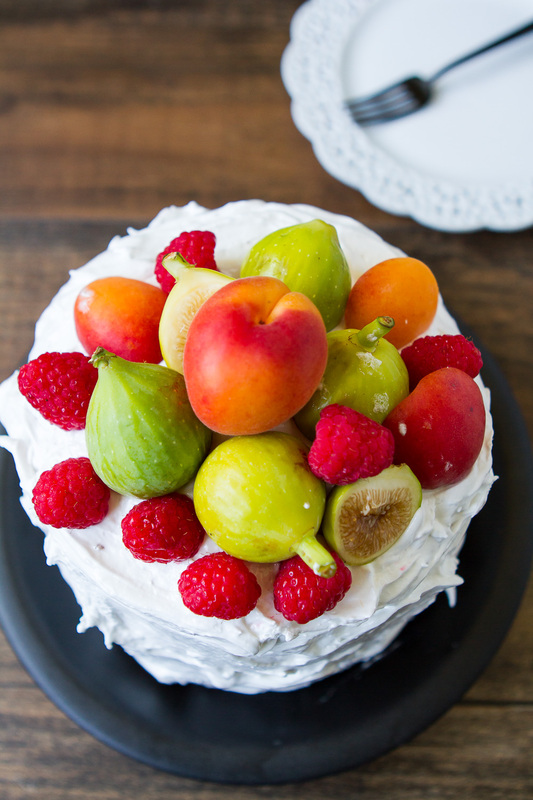 Decorate with fresh fruit or leave plain. Let the cake stand UNCOVERED at room temperature before serving. Covering the cake makes the frosting very soft.